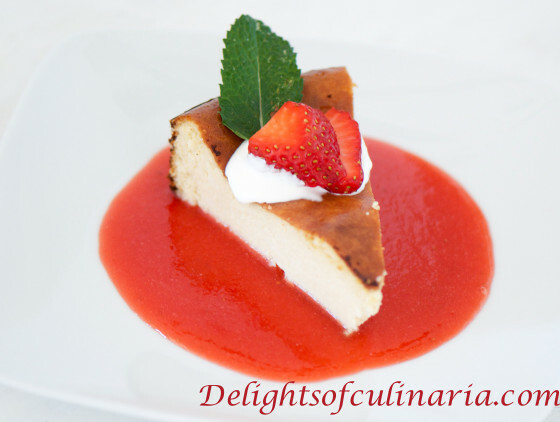 Zapekanka is a russian style cheese cake consisting of tvorog(farmers cheese) or ricotta cheese.This recipe is delicious and perfect for breakfast or for a dessert after lunch or dinner.It has only three ingredients which makes it very easy to make and serving it with strawberry or raspberry sauce is optional. Line and grease the bottom of 9 inch springfoam baking pan with parchment paper. Using a hand or stand mixer,beat eggs with tvorog. Add condensed milk and beat well to combine. Transfer the batter to the baking pan and bake for about 1 hr and 15min. Combine strawberries or raspberries with little sugar using a hand or stand blender. or bring the pureed strawberries or raspberries to a slight boil , then pass it through fine mesh sieve. Serve with sour cream and sauce if desired. Its one can + half of can= 1 1/2 can. My can is 14 ounces (396 grams).hope this helps. Great recipe – thanks! I love-love-love zapekanka and always happy to learn new recipes. I always use the same recipe: http://stylesprinter.com/top-5-nostalgic-russian-dishes/ and it always comes out very moist and delicious. What can I say. It is delicious. I have been making zapikanka already second time in 4 days window frame. What I am working right know is to reduce sugar and amount of condence milk ( i already have reduced to 1 can of condense milk and 3/4 cup of sugar). My husband likes to eat zapekanka without sour cream ( which makes zapikanka too sweet). Otherwise I love it. Thank you for delicious breakfast recipe. I am making zapekanka a night before. oh, plus my three kids ages 5, 3.8, and 2 like it. My older daughter always asking for bigger portion size. Definitely it is good for 2 days. Waiting for more delicious breakfast ideas and recipes.